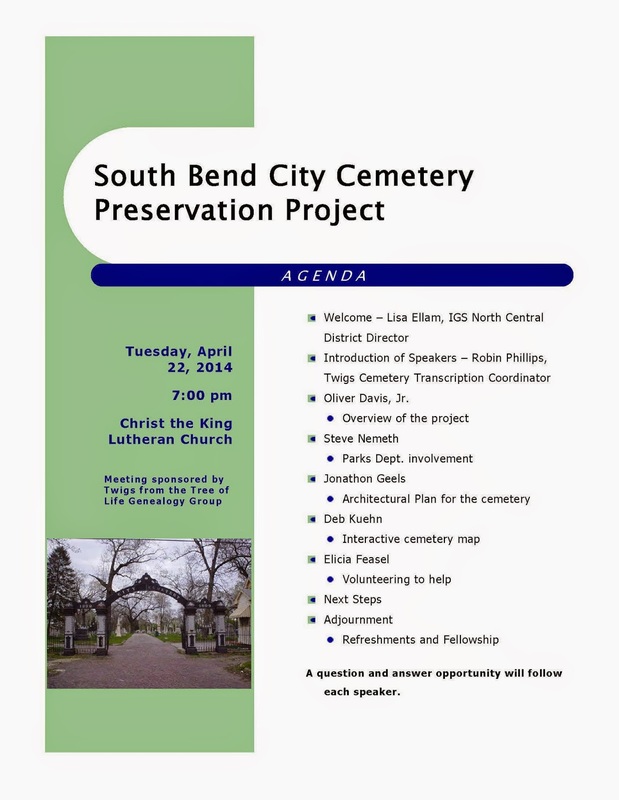 South Bend City Cemetery - Please join us! My last post revealed the short life of Ralph ELLAM (1907 - ca. 1919) who died of a broken neck when he fell out of an apple tree. This post deals with another tragic death of a Ralph ELLAM. This Ralph ELLAM is my husband's great-great-great grandfather (and also the great-grandfather of young Ralph above). Born 1 May 1823 in St. Helens, England, Ralph was one of 9 children born to Ralph ELLAM (1788-1846) and Elizabeth HUGHES (1791 - ?). He grew up poor and illiterate, never learning to write his own name. 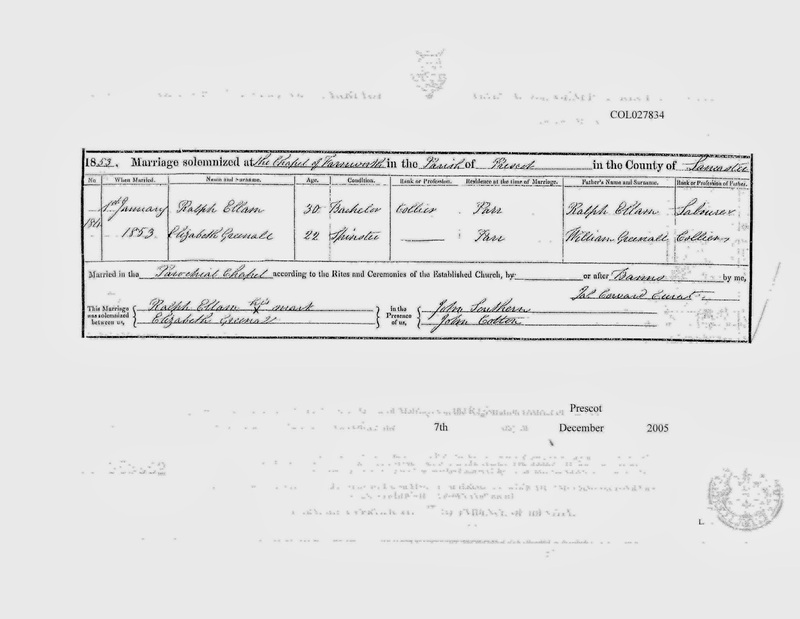 On 1 Jan 1853 at the age of 29 he married Elizabeth GREENALL in the Chapel of Farnsworth, Prescot, Lancaster, England. Tragedy struck on Tuesday, 12 Apr 1859. On that day Ralph reported to work at the Broad Oak Mines in St. Helens, England. Sometime during the day he fell off a roof in the mine causing instant death. He was 35 years old. An inquest was held on 14 Apr 1859 (the same day he was buried) and found the death was accidental. William was only 9 months old at the time of his father's death. Ralph is buried in St. Helens Cemetery and his Find A Grave memorial can be found here. 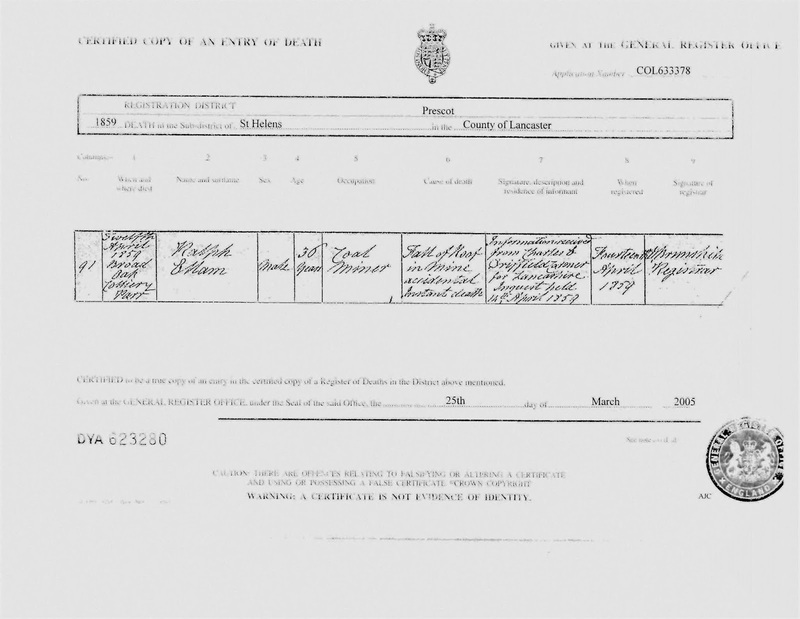 Elizabeth remarried one year later to Lambert HEATON, the only father William knew. 18 years after his death Elizabeth finally received the effects of Ralph's estate. Effects valued ess than £50 (less than $82 US today). Recently I discovered there was another brother! 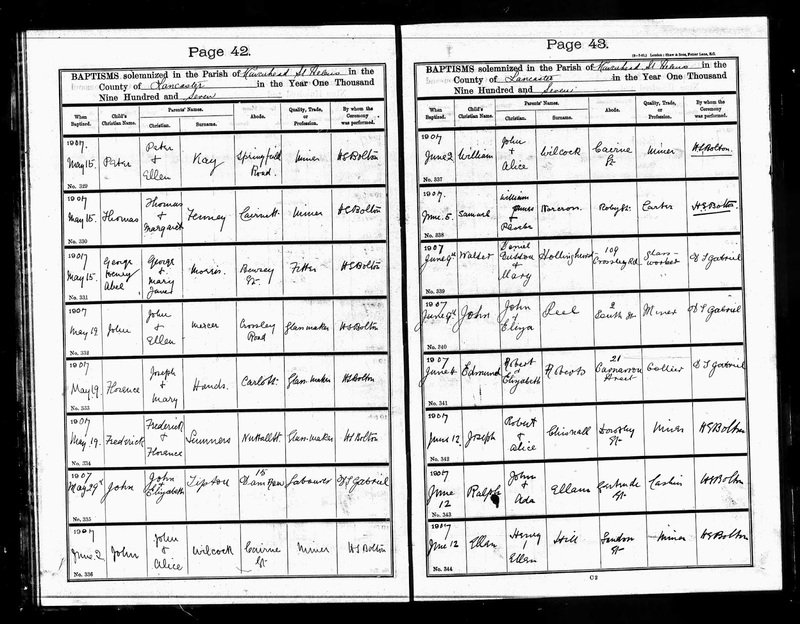 I found Ralph's birth record in the England & Wales, FreeBMD Birth Index, 1837-1915. What I can't locate is his date of death. Family lore says young Ralph fell out of an apple tree around the age of 12-13, broke his neck and died. That would place his date of death between 1919-1920. I can find his parents John and Ada in the 1920 census in Bridgeport, CT. However, none of the boys are listed with them. Society Saturday - Preserve the Pensions - Indiana Steps Up! The Federation of Genealogical Societies (FGS), The National Archives, Ancestry.com and Fold3.com are partners in a huge effort: to preserve and digitize 7.2 million pages of War of 1812 Pension Records and make them available for free online. As of today over 850,000 images have been digitized by volunteers but the effort needs your help! Ancestry.com has generously stepped up and agreed to cover costs to digitize HALF of the War of 1812 pension records. So every dollar donated will actually go twice as far! I was proud to see many Indiana Societies, Organizations and family researchers on the list of contributors! So proud of my Hoosier state! Please consider donating to this tremendous effort. Your dollar matters.